For those customers who prefer niobium or are wanting tiny disc post earrings, I now have these handcrafted niobium post earrings available in a variety of colors. The post diameter is 21 gauge, slightly thinner than the standard 20 gauge post of Dirinda's titanium post earrings. The post length is the standard 10mm. 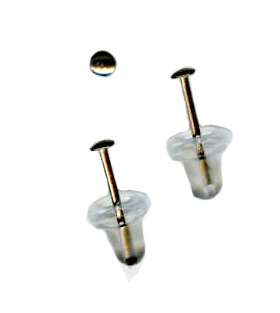 These 2mm disc are tiny and these earrings are not recommended for those with large piercing holes or stretched out piercings as this tiny disc may pull through the piercing. Available in natural finish niobium or the following anodized colors: pink, yellow, teal, purple, blue or bronze. Choose your color choice in the Color drop down box above. These earrings come with hypoallergenic rubber clutches.